Bennett Hall, a community activist credited by Downtown Magazine with helping clean up Union Square, was watching the bicyclists on Market Street with a friend in front of Nordstrom's. He reported observing a peaceful scene. A police officer stopped a female cyclist at random and began writing her a ticket and berating her though she had committed no offense. Hall, a professional photographer, had his camera with him and began taking pictures of this scene. Hall was asked to stand on the curb. He did. As he continued shooting, the lens of his camera was struck and he was dragged into the street and pushed up against a squad car. Seconds later his arm was twisted behind his back and his camera taken. Another pedestrian succeeded in rescuing the camera from the police and threw it to the crowd with the instructions: "Get it to the Chronicle!" Eugene Hill, who picked up the camera was tackled, kicked, beaten with riot clubs, and pepper sprayed. At this point, police began assaulting cyclists and pedestrians. Photographer and community Leader, Bennett Hall was arrested and charged with battery on a police officer. The officer alleges Hall battered him with his $4,000 camera Friday July 25th, at 7:30 p.m. at Powell and Market, while Hall was taking pictures of the Critical Mass ride. Witnesses report however, that Hall, often referred to as the "Mayor of Powell Street", was intentionally assaulted by Tactical squad Officer Cardenas, who dragged Hall into the street off the curb. As the crowd shouted, "Let him [Hall] Go! ", Hall alleges Cardenas threatened to break his arm if he didn't give him the camera. Facing this threat, Hall gave Cardenas the camera, cautioning him of its value. Witnesses reported Cardenas then recklessly threw the camera inside his patrol camera. Thirty seconds later, Amber Colliton, concerned for Hall and the cameras' safety, jumped from the crowd, pulled the camera from the squad car and threw it into the crowd shouting, "Get it [the camera] to the Chronicle." As the crowd echoed Colliton's cry, the "flying" camera first hit police reporter, Rodney Foo of the San Jose Mercury, in the chest causing him minor injuries. Then, Eugene Hill, 47, a bystander, picked up the camera and attempted to leave the scene to go to the Chronicle. Another Tactical Squad officer then tackled, clubbed, kicked and pepper sprayed Hill, causing him severe injuries. Immediately after this incident, numerous other cyclist were attacked and arrested by police in a melee sparked by the crowds outrage at Hall's arrest and Hill's beating. Later, Hill, in agony and handcuffs at Southern Station, was demeaned by officers and paramedics and denied proper medical care for his injuries, said witnesses. Hall, who has led a volunteer effort, dramatically improving public safety at Powell & Market, working with SFPD and the business community for over five years, questions how SFPD could allow this travesty of justice to occur. Hall, who was never read his Miranda rights, has been advised by counsel to file charges in Federal Court for the violation of his civil rights as well as criminal charges against Officer Cardenas for assault and battery, false imprisonment, reckless endangerment, threatening him with grave bodily harm, destruction of property and perjury. Hall further intends to engage in civil litigation against Officer Cardenas, SFPD and the City of San Francisco. Eugene Hill, 47, Unix system administrator with Chiron, initially faced felony grand theft charges for catching the camera and attempting to take it the Chronicle. Amber Colliton, the girl who "liberated" the camera spent several days in jail also facing felony grand theft charges, unable to make bail. Felony Grand Theft charges against both Hill and Colliton were dropped when Hall refused to testify they intended to steal his camera. Hall maintains neither intended to steal his camera and only trying 5to get the camera to the Chronicle. Hill has been advised by counsel to join Hall in taking legal actions. Curiously, Hall and Hill, both pedestrians, remain two of the six from critical mass facing serious charges and police continue to hold his camera, unlawfully seized as evidence. Hall demands the City of San Francisco and SFPD apologize for the reckless and criminal actions of some of their officers during this event, wherein they acted as provocateurs, precipitating violence, injuries and destruction to property, including criminal assaults. Hall further demands Officer Cardenas be terminated from SFPD and be arrested & prosecuted for his criminal conduct. Mayor Willie Brown said, "The City did its best to see everyone who broke the law will pay the price." Hall asks Mr. Brown, if you are telling the truth, then will Officer Cardenas and others from SFPD who assaulted our citizens and violated their civil rights be held accountable and pay the price as you guarantee? Witnesses report numerous other incidents of police assaults and brutality on citizens. One of the most shocking involved a woman who was grabbed and thrown with her bicycle by two officers who jumped out of a police van, while she was talking with a friend on their bicycle in the gutter at 5th and Market. She crashed onto the brick by a Bart entrance ten feet away. Without citing or arresting her, the officers got back in the van and fled the scene, driving down the street to repeat similar behavior in front of Macy's-furniture store. In other incidents, cyclists were pushed off their bikes by officers on motorcycles, then tackled, beaten and arrested. These events and others like them were witnessed by hundreds of international students viewing from the windows of the Park 55 Hotel where they were staying. Later, the scene at the Hall of Justice-Southern Station was described by witnesses as being like a victory party after a football game. Officers were demeaning and teasing prisoners, denying them access to bathrooms, medical care, refusing to loosen overly tightened handcuffs and laughing while telling stories of how they executed "justice" on the cyclists. Despite being well know to Captain Martel and Sgt. Ramsey, Hall remained in handcuffs until 12:30 AM the next day. Hall is local business owner & professional photographer with his company headquarters and showroom at 41 Powell Street. 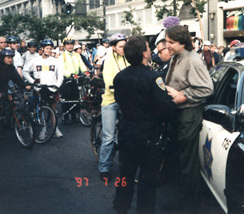 Hall, founder and President of the City Center Partnership, (CCP), a 501C-3 non-profit corporation, has for over 5 years worked with the SFPD, the Mayors office, BART-Police, DPI and other City agencies in concert with the business community to create a safe and friendly Union Square/City Center environment. Hall, referred to by Captain Martel of Southern Station as very "Pro-police", has worked selflessly improve public safety, stimulating a long overdue clean-up and revitalization the area. City Center Partnership, with ten employees dedicated to improving the area, was recently awarded a major grant from BART, solicited by Hall specifically for public safety in the Powell/Market Corridor. In addition, CCP has received a major grant from Mayor Willie Brown's Office of Protocol and from San Francisco Beautiful. Hall is now being terminated by the Board of CCP, apparently over this incident. Hall's $4000 damaged camera, which he inspected in front of Captain Martel, Sgt. Ramsey and Simpson and the two arresting officers, was still on frame 35 of 36 when he handed it back to the arresting officer who seized it as evidence-leaving Hall without equipment essential for assignments and his livelihood. We must wonder what will be on this film when it is developed? Reference: Cover Story - San Francisco Downtown-February 1997: "Downtown Standout"